Macao Art Garden, the city’s first building dedicated to local artistic creation and exhibition was built with the support of the Secretariat for Social Affairs and Culture of the MSAR government and with the collaboration of Art For All Society, Macao Artist Society, Macao Sky and Earth Ceramic Association and the Macao Sculpture Association. The project serves to cater for the government’s policies in promoting the development of its arts and culture, culture industry, and in turning Macao into a world leisure and tourism centre. 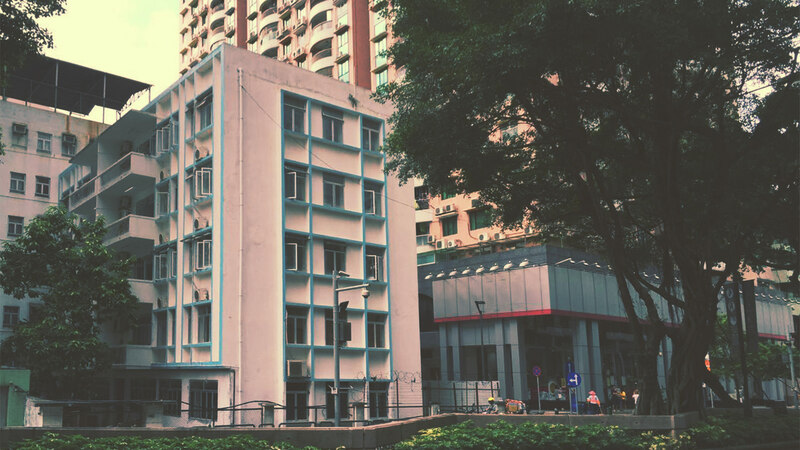 Macao Art Garden, an artistic creation centre aimed at enhancing the atmosphere of art creation, emerged from a delipadated 50-year-old Chinese tenement building, situated on the Avenida Dr. Rodrigo Rodrigues in Nape district. The place is quiet and near to the Nam Kwong Building, Pooi To Middle School and St. Rose of Lima’s School, and a haunt for visitors as it is adjacent to various hotels. Being in a convenient location for public transport with constant visitor flow, the facility is expected to help turn the district into a hot spot for artists, attracting residents, tourists, and art lovers, especially young people to the district, where they can learn more about local art and culture and participate in relevant activities. The five-storey Macao Art Garden occupies a total building area of 14,000 ft2 with an outdoor garden covering an area of 3,000 ft2. On the ground floor, there is an exhibition hall displaying artworks created by local and global artists, an art book corner and a gift shop selling artworks and cultural and creative products, including those from members of various arts societies (oil paintings, Chinese paintings, prints, ceramics, sculptures and photos among other things), various painting albums, art books, postcards, cultural and creative products and arts supplies developed by Macao artists. The space serves as a sales platform for artists, which together with the exhibitions, will help draw in more visitors to the area. On the first floor you will find the Children’s World of Creativity and another exhibition hall, where solo and joint exhibitions of local artists are regularly held to improve the exposure of young artists’ works. In the evening, the hall is used as classrooms for courses on painting, photography, sketching, portrait painting and other art subjects, as well as a venue for art lectures from time to time. Various types of weekend, children and teenager art programmes are also held here. The Art Studio between the second and the fourth floor provides 36 creative spaces, each covering an area ranging from 100 ft2 to 340 ft2. Nearly 50 local artists have already set up their studios there. The Macao Art Garden is established to congregate art creations, exhibitions, education, exchanges and trades in one place, through organised use of resources, spaces and the collective artistic and creative strength of local artists of Chinese and western painting, sculpture, photography, ceramics, installations, and other forms. The purpose of localising the artists is to foster and assist in the diverse development of local artists, promoting and bolstering local cultural and art atmosphere, facilitating exchanges with overseas artists, thereby improving Macao’s cultural image in line with the government’s cultural development policies. In addition to providing a creative space and exhibition & sales platform for local artists, Macao Art Garden offers various art courses to cultivate residents’ interests in arts, enhancing their competence in artistic appreciation and passion for arts for wider public participation. Better public aesthetic awareness will largely benefit the building of a harmonious society. The holding of various exhibitions allows residents to appreciate high-quality artworks created by local, Mainland and foreign artists. Meanwhile, arts lectures, workshops and appreciation sessions are opened to arouse public interest in art appreciation and promote exchanges between artists. The Art Studio offers creative spaces to artists in various fields, while the art courses and exhibitions organised are conducive to art exploration and development. The gift shop featuring cultural and creative products renders essential channels for seeking and expanding art-trading markets, enabling artists to focus on their creation, thereby creating the conditions for continuous artistic creation, hence the development of local creative industries. In general, the Macao Art Garden will be an integrated space for the use of local artists, a learning space for the youths that are interested in learning or being artists and a place for artists to put their ‘creative dream’ into practice. The facility will help pass down and develop local culture, strengthen talent training in this area and boost the city’s creativity for the prosperity of the local art industry and improvement of residents’ intellectual refinement, giving new momentum to the construction of Macao into a world tourism and leisure centre. Arts development requires a benign atmosphere as much as the growth of a plant requires nutrients and a suitable growth environment. The Macao Art Garden logo combines Art with Garden, meaning Macao Art Garden is an ideal place for art development. The logo comprises the colours of blue (water), brown (soil), white (air) and green (growth), which carry an expectation of Macao’s art development to flourish one day in the future.